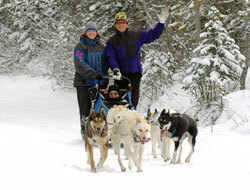 Experience a dog sled tour you won't forget and take a dog sled tour in the Spray Lakes area, just outside of Canmore. You will be taken through the pristine wilderness under careful supervision of your guide. There are opportunities to get to know your dog team and to take plenty of photographs!